We are a couple of days late with our look back at Kentucky baseball in 2010, but hopefully you can spare one more retrospective with this look at the year’s best highlight from each level of baseball in the Bluegrass State. Bowling Green native and Greenwood High School alum Corey Hart batted .283 with 31 home runs, 102 RBI, 91 runs scored and 158 hits in 2010 for the Milwaukee Brewers. 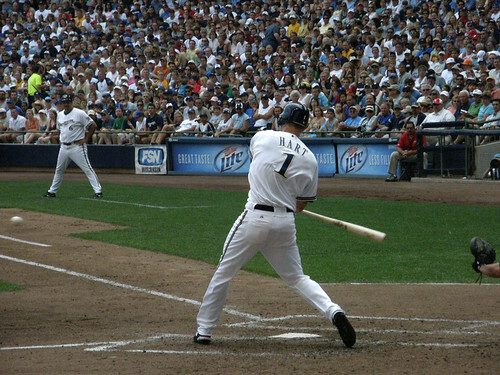 Along the way Hart started for the National League in the MLB All-Star Game, signed a three-year contract extension and participated in the home run derby. Hart recorded career highs in home runs, RBI and runs scored in 2010 and finished the year in the running for Kentucky’s best MLB hitter. One-time Louisville Bats Josh Hamilton and Joey Votto named MLB MVPs. One-time UK outfielder turned second baseman Jason Kipnis ended an impressive 2010 season by hitting for the cycle for the Columbus Clippers after being promoted to AAA for the team’s playoff run. Kipnis batted .307 with 16 home runs, 74 RBI and 96 runs scored across two levels during the regular season. Kipnis finished his college career as an all-American after transferring to Arizona State and has certainly followed through on the promise that led Cleveland to select him in the second round of the 2009 draft. Kipnis enters 2011 with a chance to make the Indians’ MLB roster out of Spring Training. Non-drafted free agents Richie Rowland, Marcus Nidiffer and Tyler Gatrell excel in professional debuts. The University of Louisville clinched its second straight Big East Conference championship with a double-header sweep of Notre Dame on May 23. The Cards were eliminated from the NCAA tournament one win shy of the super regional, but were on cloud nine after outscoring the Fighting Irish 23-6 in the championship-clinching series. UofL sophomore second baseman Ryan Wright put together an All-American season, and the Cards boasted a state-high 10 MLB draftees. Murray St. first baseman Wes Cunningham completes All-American season. Freshman starting pitcher Jordan Martin led Harrison County High School to its fourth KHSAA baseball championship with a complete-game championship-clinching win. The champions defeated Butler County High School 2-1 to win the title and ended the season on a 24-game winning streak. Harrison County placed two players on the KHSBCA all-state teams and three players on the KHSAA All-Tournament team during the state playoffs. Junior outfielder Eric Sanders was named the MVP of the state tournament.